Definition at line 33 of file RegisterUsageInfo.h. Definition at line 37 of file RegisterUsageInfo.h. 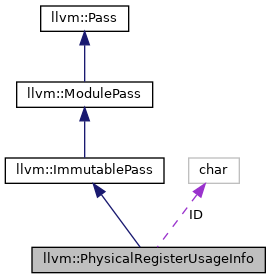 References doFinalization(), doInitialization(), llvm::PassRegistry::getPassRegistry(), getRegUsageInfo(), llvm::initializePhysicalRegisterUsageInfoPass(), print(), setTargetMachine(), and storeUpdateRegUsageInfo(). Definition at line 51 of file RegisterUsageInfo.cpp. References DumpRegUsage, llvm::errs(), and print(). Definition at line 46 of file RegisterUsageInfo.cpp. To query stored RegMask for given Function *, it will returns ane empty array if function is not known. Definition at line 65 of file RegisterUsageInfo.cpp. Referenced by findCalledFunction(), and PhysicalRegisterUsageInfo(). Definition at line 72 of file RegisterUsageInfo.cpp. References B, llvm::MachineOperand::clobbersPhysReg(), llvm::MCRegisterInfo::getNumRegs(), llvm::TargetSubtargetInfo::getRegisterInfo(), llvm::TargetMachine::getSubtarget(), llvm::printReg(), llvm::SmallVectorTemplateBase< T >::push_back(), llvm::sort(), and TRI. Referenced by doFinalization(), and PhysicalRegisterUsageInfo(). Referenced by llvm::createRegUsageInfoCollector(), and PhysicalRegisterUsageInfo(). Definition at line 59 of file RegisterUsageInfo.cpp. Definition at line 35 of file RegisterUsageInfo.h.